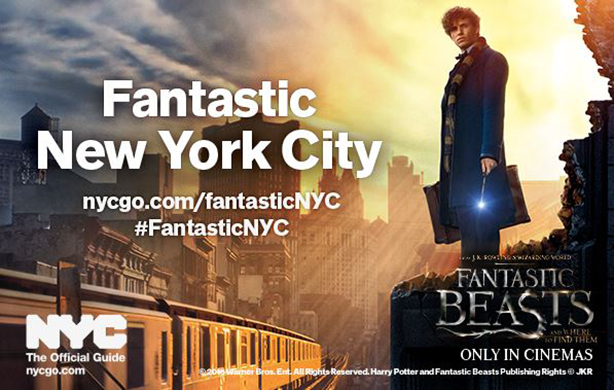 NYC & Company has partnered with Warner Bros to launch the #FantasticNYC tourism campaign, inspired by upcoming Harry Potter spinoff Fantastic Beasts and Where to Find Them. NYC & Company, New York City’s official destination marketing organisation, has teamed up with Warner Bros Pictures on the marketing and communications initiative, which aims to highlight 1920s New York City, which plays a starring role in Fantastic Beasts and Where to Find Them (trailer below). Travel PR agency Hills Balfour is rolling out the campaign in Britain, timed to coincide with the movie's UK release on Friday (18 November). Fantastic NYC hopes to encourage visitors to explore New York City through curated editorial content and social media, using the #FantasticNYC hashtag. Fred Dixon, CEO and president of NYC & Company, explained the tie-in: "There is a powerful link between film and tourism and the launch of Fantastic NYC is a wonderful opportunity to promote the modern-day magic of New York City to a global audience." "By inspiring visitors to come and experience the enchanting locations seen on screen, we can drive growth from tourism and its economic benefits across the city’s five boroughs." The campaign features tips designed to help visitors create their own NYC experiences, in the categories Magic NYC; Hidden NYC and Beastly NYC. In London the promotion will feature outdoor billboards and digital screens. Fantastic Beasts movie fans can also 'visit' 1926 New York and sites featured in the film via Google Street View. Hills Balfour also ran a themed familiarisation visit to New York City for 10 UK media titles in partnership with Virgin Atlantic.